To win a summer weekend, a movie usually needs a star name or an action-film punch, or to be a sequel to or the remake of a blockbuster. Except, that is, for any new Pixar release. 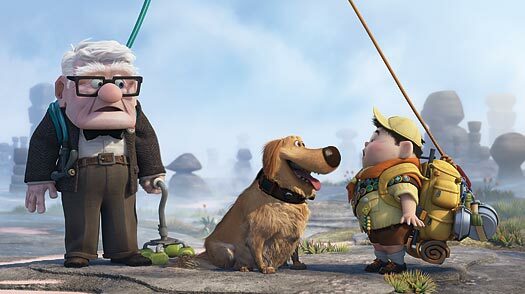 Rising on the propulsion of a brand name known for quality entertainment, the studio’s tenth animated feature, Up, surpassed most predictions by earning $68.2 million this weekend, according to official projections. Buoyed by higher ticket prices in theaters showing the 3-D version, and rhapsodic reviews that tallied a 98% positive rating on the Rotten Tomatoes web site, Up scored the strongest Pixar opening since The Incredibles in 2004. The other debut film, the gypsy-curse shocker Drag Me to Hell, looks to come in an O.K. third, with $16.6 million. Like Up, it’s a film with no stars, but a star director of sorts: Sam Raimi, who did the Spider-Man movies and, ages ago, the Evil Dead cult trilogy. Credit its success to a generous PG-13 rating, and to the loyalty of genre fans who haven’t been able to go to a new horror film in, gee, almost two months. Last week’s chart-topper, Night at the Museum: Battle of the Smithsonian lost about 53% of its steam to come in second, with a still-decent $25.5 miliion. Smithsonian did what sequels often do: pull a great first weekend from brand recognition, then subside more severely than the original. That’s the rule to which there are few exceptions. And the current exception: Star Trek, the only one of the session’s top six holdovers to drop less than 50% from last week, enabling it to become the first 2009 release to cross the $200 million mark at the North American box office. Ed Asner, who voiced the main character in Up, has a gruff side that can’t match Bale’s, at least as expressed in his obscene, YouTubed rant on the set of Terminator Salvation. But he wasn’t the lead in last year’s top-grossing film, The Dark Knight, either. That’s Pixar for you. Unlike its rival DreamWorks, the studio doesn’t sell its movies with star voices. And the films’ plots At a typical Hollywood pitch meeting, the story of a rat let loose in a French restaurant , or a lonely robot trash-collector or, this time, a cranky old guy who won’t leave his house, would be greeted by stony silence. Even the crickets would walk out. Somehow, though, people know that a Pixar movie is worth seeing, worth paying for. So Up will warm the hearts of the vast public and, perhaps, of the Motion Picture Academy members; a Pixar film has taken the Oscar for Best Animated Feature in four of the past six years. Pixar movies are not, however, the mammoth generators of box-office revenue that they used to be. The 2003 Finding Nemo earned $867 million worldwide  still tops for a Pixar feature  on a reported $94 million budget. WALL-E, which cost about twice as much to make, took in about 40% less. In worldwide ticket sales, the 1995 Toy Story, the studio’s first feature, made more than 10 times its budget; WALL-E, about three times. What keeps companies investing in animation, and make the genre the most reliable in today’s market, is that cartoon features tend to do terrific business worldwide. Box office reports focus narrowly on the Sunday numbers in U.S. and Canadian theaters. But Euros and rupees and yen are good money too, and sometimes movies that weren’t quite blockbusters here make the bulk of their gross abroad. Of the 2009 releases, the three top worldwide winners are Monsters vs Aliens, Fast & Furious and Wolverine, all of which have exceeded $300 million so far. Could you guess which of the late-2008 releases have earned about $250 million Gran Torino and Marley & Me. As for The Curious Case of Benjamin Button, it added $205 million off-shore for a total of $332.6 million. And the top-grossing film worldwide since last fall, with $352.8 million: that little runt of an Anglo-Indie charmer, Slumdog Millionaire. It’s like a Pixar movie, without the pixels.